1.5 Why spatial microsimulation with R? 3 What is spatial microsimulation? 3.1.2 Spatial microsimulation: method or approach? 8.1.5 Which test to use? 11.2.1 What are synthetic households? 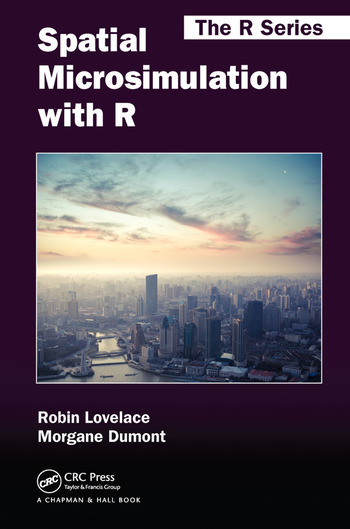 Welcome to the online home Spatial Microsimulation with R.
This is a book by Robin Lovelace and Morgane Dumont (with chapter 10 contributed by Johan Barthélemy, chapter 11 contributed by Richard Ellison and David Hensher and chapter 12 contributed by Maja Založnik). Chapter 1: what is spatial microsimulation and what is it good for? Chapter 2: if you’d like to see a very simple worked-example of the process in action. Chapter 12: for the links between spatial microsimulation and agent-based modelling. Chapters 3 to 9 explain, with reference to reproducible code ‘chunks’ embedded in the text, how to generate spatial microdata, with or without a sample population. Chapter 10 demontrates how to add household-level variables. Furthermore, there are add-on chapters for beginners to R or the discipline. If you’re completely new to R and programming in general, check-out the appendix, which will get you up-to-speed quickly. There’s also a glossary that explains some of the jargon used in this field of research. We’ve put Spatial Microsimulation with R on-line because we want to reduce barriers to learning. We’ve made it open source via a GitHub repository because we believe in reproducibility and collaboration. Comments and suggests are most welcome there. If the content of the book helps your research, please cite it (Lovelace and Dumont, 2016). Lovelace, R., Dumont, M., 2016. Spatial microsimulation with R. CRC Press.